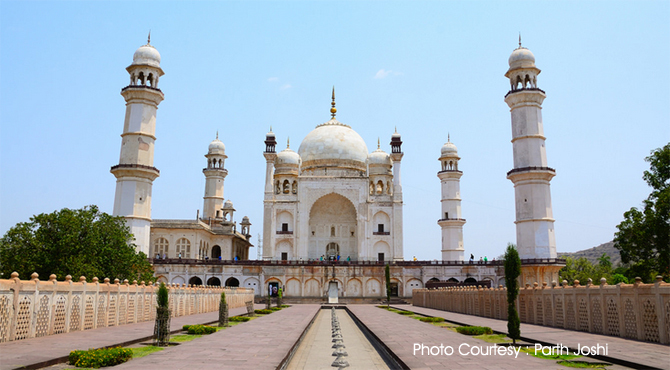 Bibi Ka Maqbara is a magnificent mausoleum, situated 5 km from Auragabad in the state of Maharashtra. Literally means 'Tomb of the Lady', this was built by Prince Azam shah, son of Emperor Aurangzeb, in the late 17th century as a loving tribute to his mother, Rabia-ul-Daurani, alias Dilras Banu Begum. Also known as Mini Taj, the mausoleum is far less ornamental, than Taj Mahal built by his grandfather in Agra (Aurangzeb was the third son of Emperor Shah Jahan who built the Taj Mahal as a mausoleum for his beloved wife Mumtaz Mahal). The construction work on the mausoleum was started in the year 1651 and it took approximately 10 years to complete it. The mausoleum stands in a square of 1,37,00 sq. meters. Set amid large beautifully landscaped Moghal-style gardens some 457 by 274 metres and surrounded by high walls with bastions set at intervals, and open pavilions on three sides, it is an excellent example of Persian Architecture. Visitors can enter in the area through a wooden entrance gate on its south. The gate has an excellent foliage designs on brass plate and it adorned with an inscription which tells that the tomb was designed by Ata-ullah, an architect, and constructed by Hanspat Rai, an engineer. After crossing the entrance, one comes across a small tank and a screen wall that leads to the main structure. As one moves through the screened pathway, one can see beautiful lush lawns, deep green cypresses trees and fountains. The screened pathway leading to the monument are flanked by pools and fountains at its centre. The ambience is overwhelmingly that of the Taj. The marble used in its construction is said to have been brought from the mines situated near Jaipur. The dome and some parts of the main building are made of marble, the rest is plastered with Eastco plaster. Though Azam Shah wanted to construct the monument in marble, but his father Aurangzeb was not in favour of building a monument as lavish as the Taj and he blocked the movement of marble from Rajasthan and various other parts of the Moghal empire. Like Taj, this impressive monument has a central dome, surrounded by four smaller domes. Four small minarets near the main structure while four larger minarets at its corners. It is built on a high square platform which is approached by a flight of steps from the three sides. It is built in a way such that it can affords a beautiful view of the garden and water bodies. The top of the Bibi ka Makbara is a huge dome, pierced with trellis works and adorned with panels having floral designs. The inner gallery and burial chamber are octagonal in shape and the whole building is adorned with beautiful stonework except the grave which is enclosed within a series of an octagonal white marble jali screens. The tips of its pillars are made of red stone. On the tomb itself, in place of a marble slab, there is bare earth covered with a decorated cloth. The second tomb in the corner is said to be that of Rabia Daurani's nurse. There is a mosque on the west side. MTDC organizes a fair every October as the Bibi Ka Maqbara festival. There is an archaeological museum located just behind the mausoleum, which houses rare collection of artifacts and articles of personal use from the times of the Mughal era. The entry fee for Indians is Rs 10 and foreigners is Rs 100 and the visiting time is 8 am to 6 pm. The other famous tourist attractions such as Daulatabad Fort, Ajanta and Ellora caves and Aurangzeb's Tomb at Khula-dabad are located in close proximity of Bibi Ka Maqbara.